" Skin infection in dogs can be caused by bacteria (pyoderma, impetigo, superficial bacterial folliculitis), fungus (yeast, ringworm) or skin parasites. Bacterial infections are referred to as being superficial (on the surface of the skin) or deep, which means that it has penetrated deeper than the hair follicles. The best approach is to visit a veterinarian who can examine a cell skin sample in order to understand the cause of the condition. Infection does not always result in symptoms, but the infected dog can still spread the infection as a carrier. The results of any testing will direct the course of treatment which can include one or more mediations such as topical creams, oral medications or an injection. 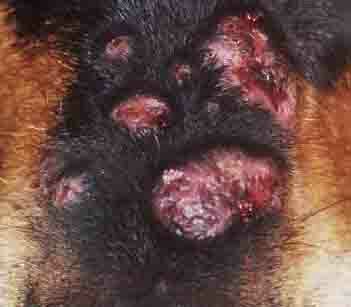 If the case is uncomplicated, any infection on the dog's skin will respond quickly. If there is another underlying cause that results causes an infection, then that will need to be addressed as part of the treatment plan." Allergy accompaned by itch and skin rash can cause scratching which results in recurrent superficicial folliculitis. Canine skin infection can have a variety of symptoms, depending on the type of infection. Red scaly skin that may also appear greasy. Will also appear on the ears. Round oozing sores on the skin. With any type of canine skin infection, you may notice bald patches, and your dog may also scratch excessively or lick or bite at his skin. Call your veterinarian immediately if your dogs face is swollen or puffy. This could be a symptom of a dangerous hypersensitivity allergic reaction. The canine skin infection will need to be diagnosed by a vet. In some cases, the veterinarian will be able to diagnose the infection just by looking at it. In other cases, tests will be needed in order to determine the exact nature and cause of the infection. Tests may include examining the affected area under a special ultraviolet light, taking a swab of any seepage from the area to be examined under a microscope, and/or blood tests. 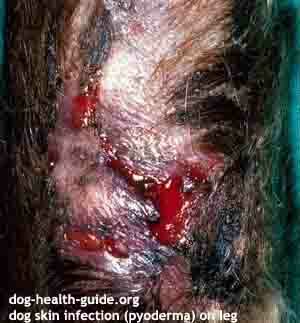 Sometimes the dog skin infection is secondary to another condition. This means that your dog has another problem that causes his skin to itch and he has scratched so much that it has caused the area to develop a bacterial infection. In that case, the skin infection must be treated, but the underlying cause of the itching must also be determined and treated as well. The treatment of dog skin disorders depends on the cause of the infection. If it is a bacterial infection, oral antibiotics are prescribed for a minimum of three weeks. It takes two weeks for the skin to clear and one week to ensure the condition is cured. If the bacterial skin infection returns, then dogs are treated for another 6 weeks. In the majority of cases this results in a complete cure. If it does not, a veternarian will look for an underlying cause. Some veterinarians prefer not to repeat the antibiotics and instead manage the condition using long term topical prescription shampoo therapy. The shampoo is left on the dog for 10 minute in order to penetrate the skin and canine skin infection. If it is a fungal infection, oral anti-fungal medications are usually prescribed, along with medicated shampoos. 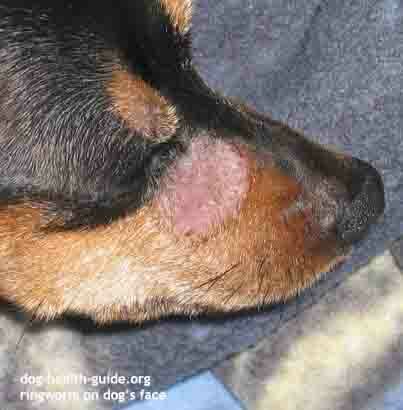 There are also natural dog ringworm treatments. Other options are topical antibiotics and anti-fungal creams, but your dog will probably lick these off before they can be effective. You will need to discourage your dog from scratching or licking the affected area so that it can heal without further irritation. If your dog frequently suffers from skin problems you might want to try a homeopathic supplement like PetAlive Skin and Coat Tonic which is designed for this purpose. Ingredients to look for include Equisetum arvense (Horsetail), Taraxacum officinalis (Dandelion), Arthrospira platenis (Spirulina), Fucus vesiculosis and Kalium sulphate. Have A Question about a Dog Skin Infection for our Veterinarian? Do you have a question about a dog skin infection or canine dermatological issue? Ask it and our Veterinarian will answer it for free. Please include your dog's age, breed, medical history, medications and if possible, a picture of the canine skin condition. We will do our best to get back to you quickly (it depends on how many questions we receive each day). If you do require an immediate response we suggest using this online dog veterinary service that is available now. 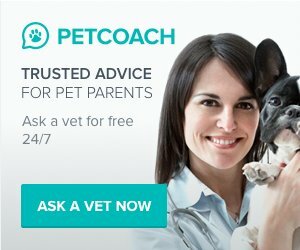 This service will answer short online vet questions for free. Do you have a picture to add? Great! It will greatly help us provide better advice that will help your dog. Click the button and find it on your computer. Then select it.